HK Marathon 2011: before, the day, and after. The good thing about a shopper like me marrying a runner, is that I get to come along for the Hong Kong leg of the Standard Chartered Marathons. Yey! Perfect! We arrive the day before the marathon. The hotel we stayed at had free airport transfers, which was really convenient. And it beats paying 300HKD for a cab. The flight landed us in HK way too early for check-in, so we just left our bags at the concierge and made our way to Victoria Park, where the distribution of race bags was happening. After getting the race kit, we make our way thru the little streets to find some place to eat. We ended up in Electric Street, and were faced with rows and rows of noodle houses. The first place that had english in their menu - we sat and ordered! Cheap, yummy and just what we needed climate-adjusting on our first day. The rest of the day, I spent with our friend Maggie, who now resides in HK. 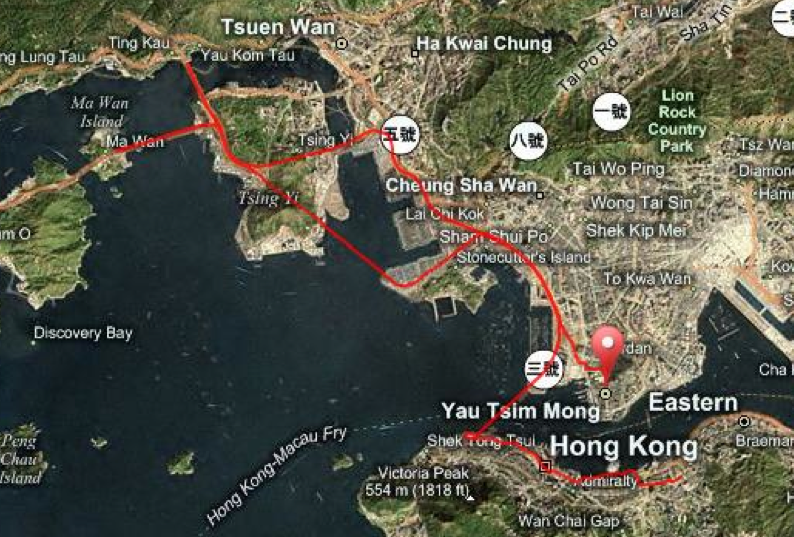 She couldn't believe the route mapped out - it's practically the ENTIRE Hong Kong! Tunnels, bridges... it's absolutely impressive how the organizers managed to close these thorough-ways to traffic. The gun start for Chips' 42k wave is at 7am, which is the latest from our experience. We make our way to Nathan Road early, because we also needed to find the baggage drop, which was on a different street. 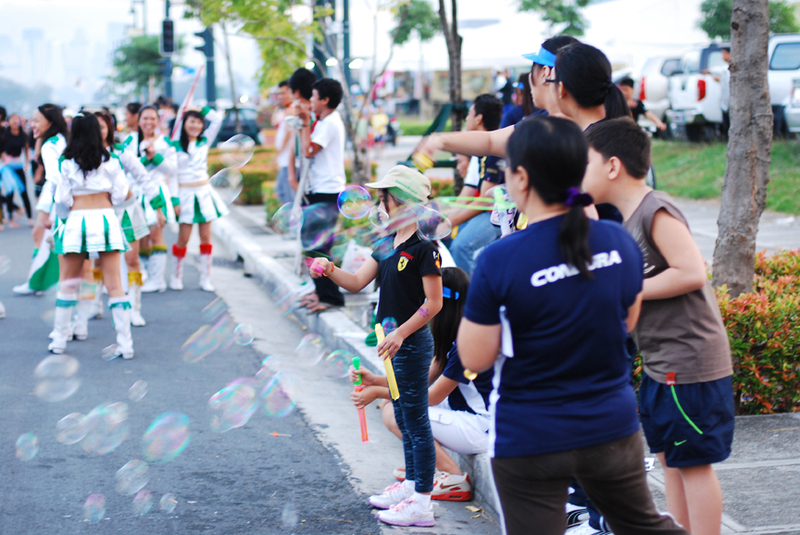 The organization of the event is really commendable, with security and traffic enforcers everywhere. I guess the good thing about HK is that their MTR system is so developed, that people could live a day with main roads closed. wearing the cheapo gloves I got him at Mongkok. better than nothing! interesting people at the starting line. can you spot the hubby? the only time I saw the MTR tunnel empty. I had the luxury of sleeping for a bit (and eating tons of bacon at the breakfast buffet) before making my way to the finish line, which was over on the Hong Kong side. This time, the MTR wasn't so empty. Walking out of the Causeway Bay exit, I was greeted by a huge throng of people squishing thru the barricades. For a moment I feared for us who were on the exit escalator, because there was no place to go and it's not like the escalator had a stop button. Thank goodness the security guys immediately fix the routing of pedestrians, and the street could somewhat breathe. I was extremely lucky that the street I ended up on was part of the actual race route. I get myself into a space between the unused barricades and prep the camera. Waiting and worrying for a good hour, I finally spot the hubby coming towards me. I scream, but he was in some zone. Didn't even flinch. After I get my snaps, I run to Victoria Park to TRY to meet him. Chips with fellow Pinoy finisher, Nino Fajardo. The thing about the hubby looking very Chinese, is that amongst 10,000 runners, he's practically impossible to spot. I actually tried, three times, to find him within the recovering and resting crowd of runners on the main event area. Until finally, I just decided to wait at our assigned "if we can't find each other, we meet here" spot. That's where I finally see him! YEY! I had to skip and run and give him a great big hug. Extremely proud doesn't event begin to describe what I feel for him. To him, it was the most awesome marathon he's ever done. They went through tunnels and huge bridges. It was so cold that his breath turned to mist, and it was hard to grab his gels from his back pocket. But the view from the bridge - both the horizon and the stomach-churning sight of the water, he says, was AMAZING. 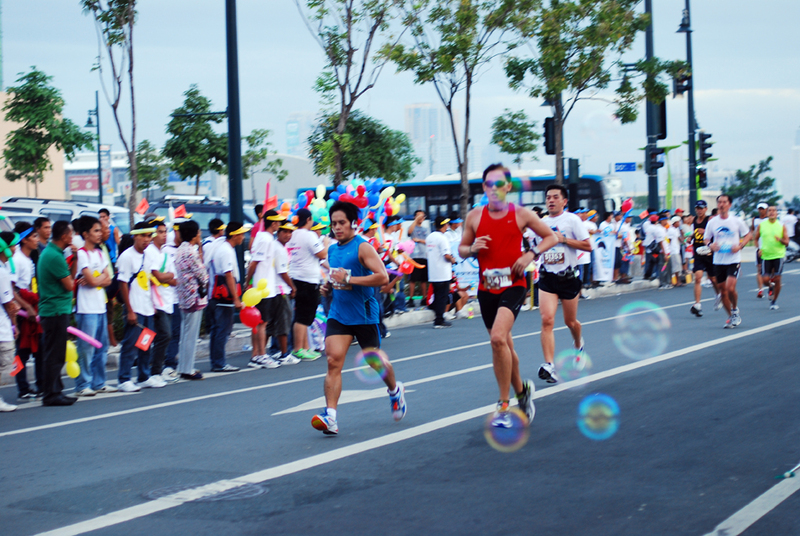 Pinoy marathons have quite a way to go still, he says. 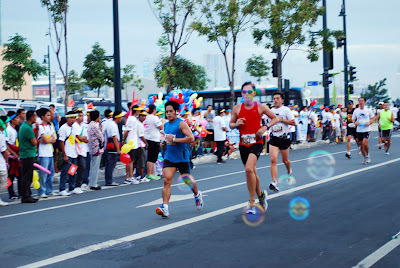 Runners in HK were so strong, that beyond 21k when normally they thin out, he still had so many people to contend with. Including runners who liked broadcasting their music instead of using earphones - one was playing Kenny G and he unfortunately was at the same pace for a good five minutes. Right after the race, we have a second dose of hot noodle soup goodness from the same noodle house of the day before. We then met up with Maggie again for a walk around Tsim Tsa Tsui. And since the race is over, Chips can now eat evil food! Yey! Cheesedogs wrapped in bacon and deep-fried! With cuttlefish japanese style, also deep-fried haha! Peking Duck in oily goodness. And we're back from Hong Kong! It was a break from the warmth and humidity that is Manila, and for the first time, I actually get to wait at the finish line wearing a scarf and a coat. A lengthier blog will follow on some anecdotes from the hubby and myself. But for now, a big CONGRATULATIONS to Chips for finishing with a PR on one of the hardest Standard Chartered marathons! You may get the official results here. That's us on Nathan Road, waiting for the start. I'm so proud of him. Not only did he get to participate in one of the biggest marathons in Asia, he also got to do it in really good time! Next up, Bataan Death March 102k. Go Team Chips! I think we were watching Criminal Minds or some Discovery Channel show and I was eating ice cream. "I think I want to run the TNF100," he continues. "Is that okay?" "Okay," I said, "it's your choice... like I can stop you." Which is true. If he didn't do it, I can bet all my shoes that he's going to be bummed to the extremes. "Well, like if there was a good reason for me to not run." I really didn't know what to give. Umm, you might break a leg? You might fall? You might get sick? And the most honest one as my good friend Shiela would say, YOU MIGHT DIE? I left that moment at that and knew that whatever health and safety concerns I may have, I'd have to reserve them. We went to the TNF store and he told the lady he was running the 100K, even if registration wasn't open yet. He was the masculine version of giddy. There was a little girl jumping up and down within that tall shell. So there it is, that's where we'll likely be on Labor Day weekend. At least I'll just be an anxious, totally unnerved wife for just oh, 30 hours (or whatever cut-off time they decide to publish). The rest I hope to spend lying on the beach with a recovering and hopefully not-so-skinny hubby. The hubby wasn't supposed to run this race, even if he had total fun running the 42k last year. 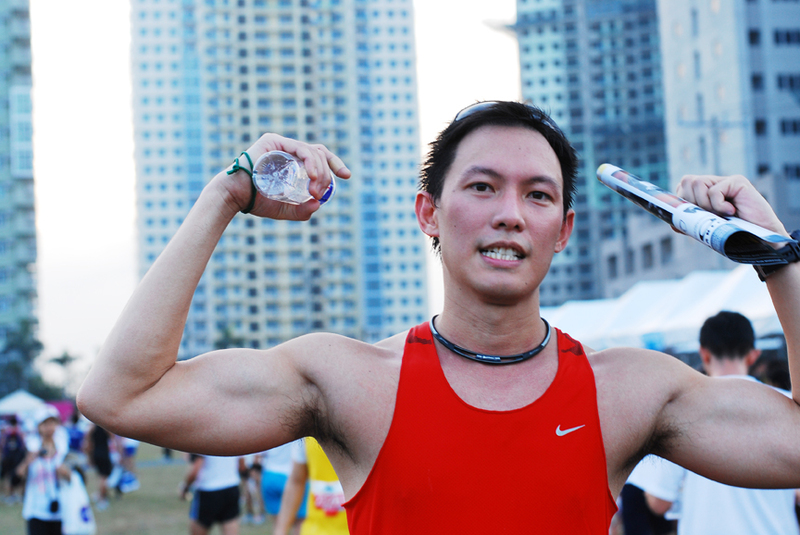 He's busy preparing for the HK Marathon on the 20th, and he didn't want to over-race himself before that big day. 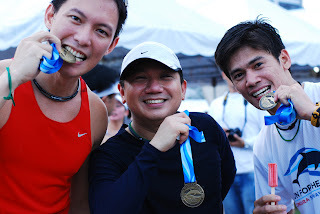 But when a couple of his co-workers asked him to just pace them for their 21k, he decided that it would be okay. He just wouldn't "race" it. The gun start was scheduled at 4:30am. 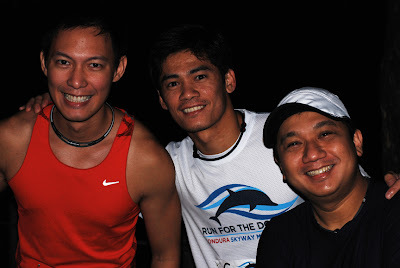 I was the designated driver to bring them from the Fort (their meet-up point) to the Ayala Triangle where the starting line was. And then find somewhere to park near the finish line. That's the trio before the start of the race. I was lucky enough to still be able to get to the Hi-Street parking lot and finding a nearby place to park. Killing the engine, I fell asleep to the sound of fireworks and people cheering. I was nudged awake by the sound of a band and people yelling. Reluctantly, I get out of the car. Some of the 21k runners were already making their way back. I guess it's another one of those "feelings" when somehow it just happens that Chips was in fact nearing the finish line. I find it cool that they had "cheerers" for the finishers. 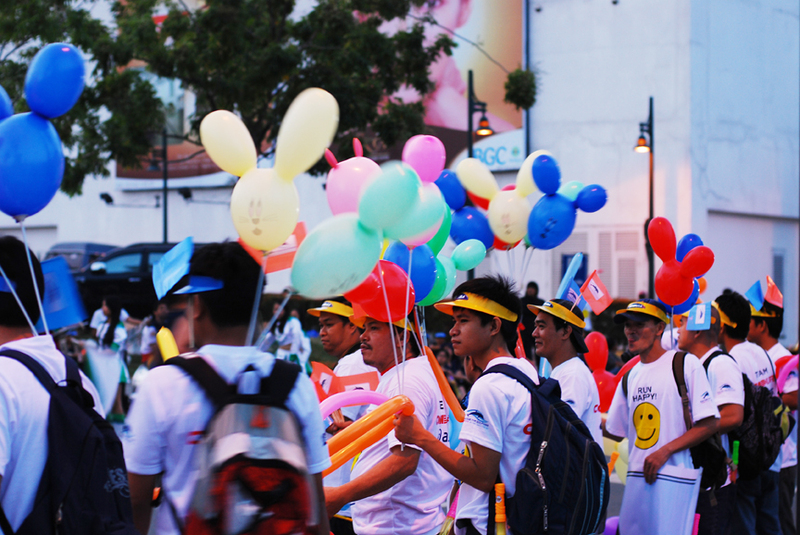 They had colorful balloons and trumpets. And I so wanted to blow bubbles. Oh man, did I want bubbles! (cue in Finding Nemo scene). It wasn't long before Chips made his way into the camera's viewfinder. I was mostly like, "hey, he looks familiar" than "yey!" because I didn't expect him to already be there. I think the "yey!" had a few seconds delay (oops). Perhaps I got used to waiting for longer periods of time (excuses, excuses). Anyway, later on we soon meet up with Frank and Jojo. We got free ice drops (yey! another) and they got their loot bags. Breakfast was schublig and barako coffee at Mercato Centrale. He didn't "destroy" his last 21k PR, but for a non-raced race, did pretty well. The official results are out, and he places 77 out of 1,804. He paced Frank and Jojo until around the 13th kilometer, where he says he still felt "really great". He then decides to break out from the pace and run the rest of the way to the finish line. Like, run his 10k pace. I don't know about you, but at 13k I'd probably have no legs. I actually begin to decompose after 3k. I am a big admirer of people who have the drive to push through the distance and strain until the finish line finally meets you to give you a big hug. 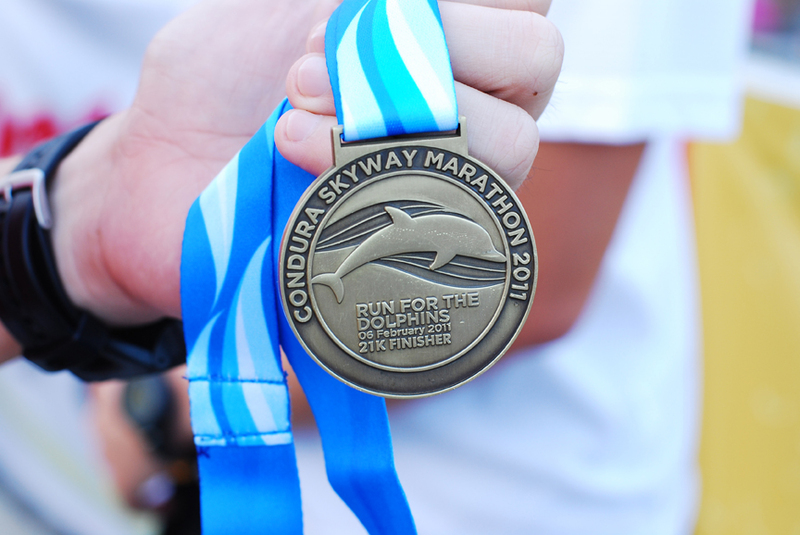 Congratulations to everyone who crossed the finish line, no matter what distance you ran. I bow down to you all. The hubby is 74 out of 1775 runners in the 21k category. I'm no whiz at math, but I think that's a pretty good rank! Yey! View the partial results here. That's the hubby in the red singlet. Bubble got in the way. I'll be posting more on the race later. Cheers! I never really paid attention to these things, until the hubby decided to do longer distances. I always thought that people wore tights because it either (1) looked really good, (2) they didn't want to show their legs, and/or (3) they didn't want the tan line. Okay, really. Forgive my ignorance. Until I actually went shopping with Chips for these things, I really didn't know. And then I look at the pricetag and I was totally blown away. THAT MUCH?!? You can't be serious. I'd rather buy shoes (that's just me). Anyway, he explained to me the benefits of "compression tights" - apparently there's something beyond candy colored footless tights and stockings (okay I feel runners wanting to stab me). He bought the CW-X Pro tights for his TNF 50K trail run in Baguio last year, and has been using them to train for long distances. Especially now that there's a bit of wind-chill, I suppose it would help prevent cramps. I'm all for investing in things that will improve whatever you want to do. I'm actually pretty happy that he has them. He appears to recover faster after runs with it. And looking at the TNF Baguio trail, I am confident about what the CW-X technology has to offer. What I HATE though, is washing the damned thing. The other day marked the first time I had to wash it. I usually just do the normal dri-fit shorts, and it's pretty easy to get the soap and water in. But there's something about these tights. I guess it's so good at compression that it's like compressing water out. It's like ti absolutely refuses to get anything into it, and I'm already using friggin' liquid detergent! I would've loved to have a washing machine. Instead, I have boney scrawny fingers. But oh I love the hubby. I will TRY to scrub and squeeze and work the darned detergent into the utterly resistant fabric. It's as resistant as me being told to give away shoes. After all the crouching down I admit defeat. I just put my faith into detergent technology and let the tights soak in the bubbled up solution. Oh, it's also great to note that despite all the fabric's thrashing in the solution, it didn't sud. It was by the grace of the Nike dri-fit shorts that I actually got suds. For good measure, I soak it well over the prescribed time that the detergent label said. Rinsing it was another problem. I wanted to scream. I told Chips about his piece of uncooperative prized clothing and at least last night I didn't need to wash the dishes.